The woman was immediately taken into federal custody by the Secret Service. A female protester has thrown a shoe at Hillary Clinton, the former Secretary of State while she was delivering a speech in Las Vegas, media reports said. 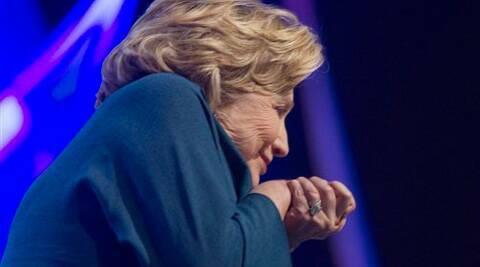 Clinton, who is widely expected to run for the 2015 presidential elections, had to dodge as the protester hurled her footwear at her during her keynote address to the annual convention of the Institute of Scrap Recycling Industries. “Is that somebody throwing something at me?” Clinton asked, putting her right hand above her eyes to cut the glare of lights from the stage, Las Vegas Review Journal reported. “Is that part of Cirque du Soleil?” she quipped amidst laughter from the audience. “My goodness, I didn’t know that solid waste management was so controversial…Thank goodness she didn’t play softball like I did,” she said. The Secret Service said the women, who wished not to be identified, sneaked in the auditorium with a capacity of some 1,000 people.